When you hear the term “Dog Whisperer”, who comes to mind? Unfortunately, most people think of Cesar Millan because of the National Geographic program by that name. The original “Dog Whisperer” is actually Paul Owens who started using the title in 1999 – five years before Cesar Millan started using the title. Paul Owens is a positive reinforcement trainer and member of the Association of Pet Dog Trainers (APDT) and is endorsed by The National Association of Dog Obedience Instructors (NADOI). In 1999 he published two books, “The Dog Whisperer” and “The Puppy Whisperer”. He released an updated 2nd Edition in 2007 with the subtitle “A Compassionate Nonviolent Approach to Dog Training”. You indicate on your website that you are not affiliated with the National Geographic program, “The Dog Whisperer” which features Cesar Millan . I’ve never seen him use inappropriate or violent techniques with animals so why are you distancing yourself from him? The methods demonstrated by Mr. Millan include the use of choke collars, jerking, hitting, asphyxiation, pinning to the ground, etc. He has stated that any method is okay to use as long as it works. He uses physical punishment and “flooding” in order to suppress a dog’s behavior. Physical punishment involves applying a physical aversive to reduce the probability of the behavior continuing. “Flooding” refers to physically forcing a dog into an overwhelming situation he or she is afraid of until the dog “shuts down” or the behavior is suppressed. Using negative methods with fearful or aggressive dogs is actually dangerous (as demonstrated on the program) and unnecessary. People trying these methods at home, could likely kill their best friend. They are certainly not very easy on the dogs. Most importantly, these methods are not the most effective in modifying problematic behaviors. Behavioral science has shown that suppressing behavior, especially through physical force or the threat of force, does nothing to bring confidence to a fearful dog or calm an aggressive dog, it only suppresses that behavior (out of fear) in that particular situation. Most of the physical-force methods demonstrated on this program are in contrast to the positive behavior modification programs used by professional trainers around the world, including the leading veterinary schools of behavior at University of Pennsylvania, Tufts University, Cornell, University of California at Davis, and many others. They have found negative training to be unsafe, unnecessary and ineffective in the long run. Thirty years ago I used most of the negative methods shown on the National Geographic program and became skilled in both positive and negative training. In the past 15 years, along with other professionals and the leading animal behavioral scientists at the institutions referenced above, I have abandoned negative training, finding it to be less effective and certainly not as kind as positive training. I believe positive training is easier and more effective with even the most aggressive or fearful dog, as well as being less stressful for the human. Five years before National Geographic’s “Dog Whisperer” became a worldwide hit, Paul Owens released a DVD and book with the same name but an entirely different approach. Andy Sternberg met with Owens to discuss the bastardization of the art of “dog whispering.” “The original meaning of the term “Dog Whisperer” was treating any kind of animal with kindness, respect — in other words without physically forcing them to do anything,” according to Paul Owens, a dog trainer who coined the phrase “Dog Whisperer” when he published a book in the 1990’s. The more famous dog whisperer, National Geographic television’s Cesar Millan, displays a training philosophy that is much more aggressive and warlike than Owens’s. Millan’s methodology assumes that dogs are more apt to follow the leadership and energy of an aggressive owner as opposed to a passive one, according to Owens. But Owens takes a more zen-like, Gandhian approach. When you train your dog, you’re actually training yourself to be a better human being, he says. 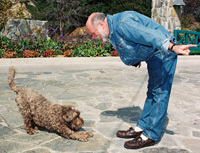 “Basically this whole program is about teaching people how to raise and train their dogs using non-violent methods.” In describing this holistic point of view, Owens launched into song: “We call it the nine methods: food and play and socialize; quiet time and exercise; give your dog a job to do; lots of rest when days are through; train with love respect and care; and see your vet throughout the year.” Owens hesitates to describe what he calls Cesar Millan’s bastardization of his dog whispering concept, after all he continues to reap the benefits. “Everytime he’s on the news or he’s on a program like Oprah or something else, our book sales and DVD sales go up, so inadvertently he’s introduced a lot of people to positive training,” says Owens. But this positive, pacifist training method, apparently isn’t cut out for prime time television. Thanks for stopping by! I wish the original Dog Whisperer was the more popular one but it doesn’t make for good TV drama obviously. We can only try to keep educating and sharing the truth for dog’s sake! Me too. Today we had the non original guy in tv for 2:25 hours, although a lot of organizations and people complained about this guy. But sadly for the tv-stations money counts more than truth…. I would love to see his approach to dog training. It sounds like a very interesting method.